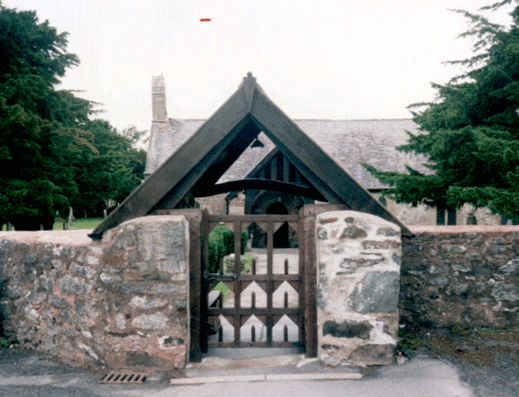 This is the only Medieval Church in the British Isles dedicated to the Body and Blood of Christ. 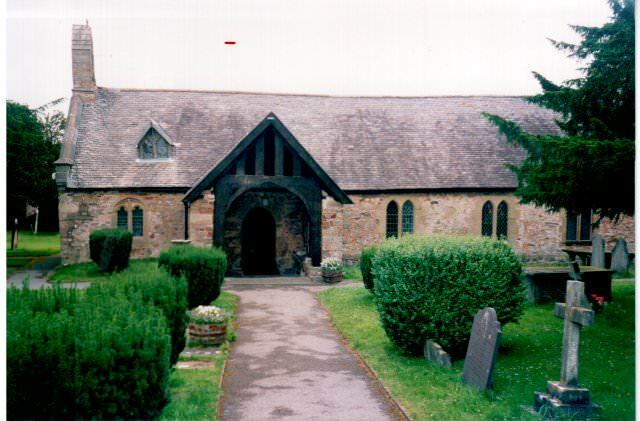 The present building nestles in a circular churchyard surrounded by ancient Yews, perhaps founded by a follower of Saint Beuno in the 6th century. A Maltese Cross on the Bell Cote is another indication of this place as being a place of pilgrimage. In the years after Gabriel Piozzi and Hester Lynch Thrale took up residence at Brynbella, they improved the scandalous state of the church - the family church of the Salusbury family. 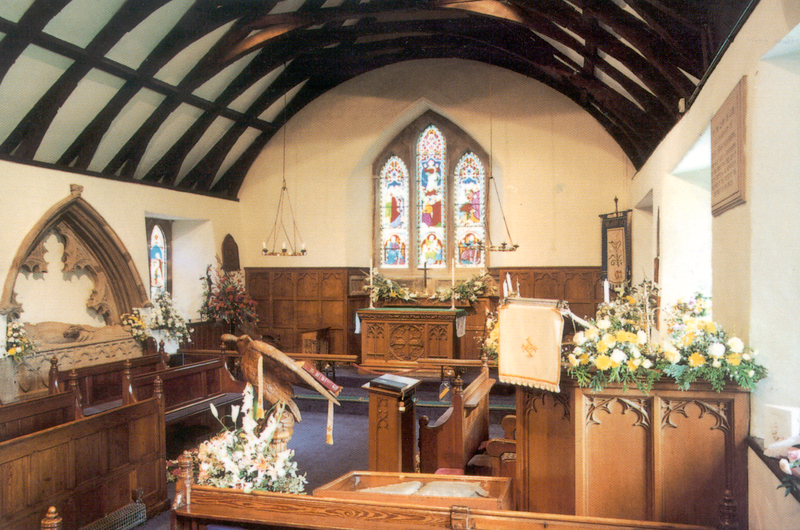 They replastered the walls, repaired the windows, pews and pulpit. A new vault has been constructed under the Altar at Dymerchion for his and my last cold Residence, & narrow Apartment—Poor dear old Lucy Salusbury my admirable Progenetrix & Mother to my Father 1 Was found crumbling in Dust; her Skull only whole, & the Black Ribbon pinned round it, that I suppose bound her head in its last Agony 2:—There was no Act 3 then extant for burying in Woollen. My Father being wrapt in Lead was easily discerned from his Brothers, & dear Mama—as he called her to the Last—They had never found Money to make themselves a Vault, so their poor Bones have been gathered up now by Mr Piozzi, and placed decently in our new Repository, where ours will shortly accompany them no doubt: to the great Joy of all my Daughters who really have now waited my Death so long—They are justified in their Impatience. New Pulpit Cloths—new Reading Desk Bible & Surplices—& a new Brass Chandelier—in Lieu of a Wooden one—are among my present Master's 4 Donations—beside Slating & Glazing & painting & Whitewashing: & what our Curate Mr Roberts prefers to all—Enlarging his little Church in the Gallery-Part—& we will put up the old curious Cross wch some fools pulled away 40 Years ago— & make all smart and handsome. In winter 1804, Hester wrote verses on the restoration of the Church. 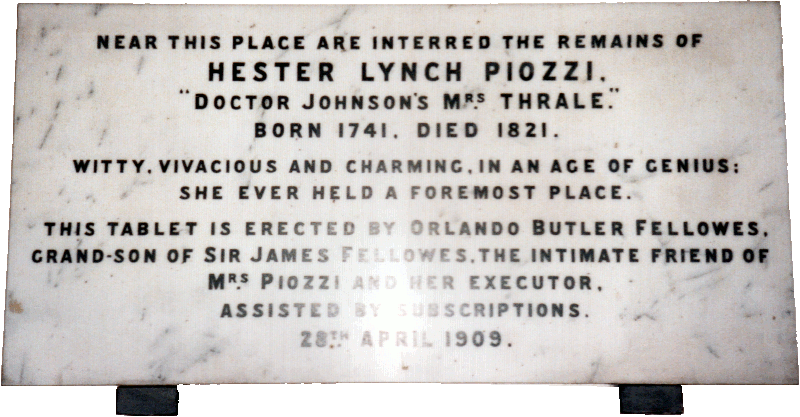 Hester Lynch Piozzi (formerly Thrale) has a mourning tablet erected inside the church. 2. She died in 1745. 3. Burying in Woollen Acts 1666-80.